"I wanted to take a second to tell you what a wonderful venue the Lazy B was for my daughter's wedding reception last May. The service, facility, and hospitality were flawless and first rate. It could not have been better!" Savor Montana’s beauty at the Lazy B Guesthouse in the pristine Gallatin Valley! Located on an 800-acre working farm, our guests enjoy a uniquely rural setting, experiencing the sights and sounds of life on a farm. 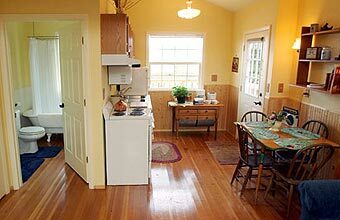 This pleasant one-bedroom guesthouse is located between the extraordinary Spanish Peaks and Bridger Mountain Ranges. Enjoy our remarkable 360-degree panoramic view of the mountain ranges with the valley spreading out below. The guesthouse includes a full service kitchen and quaint bathroom with a vintage claw foot tub, as well as a cozy gas fireplace. Ideally located, the Lazy B is 20 minutes from the Belgrade Airport and 30 minutes scenic drive from nationally known Bridger and Big Sky ski resorts. Fly-fishing and kayaking enthusiasts will thoroughly enjoy the Gallatin River, only minutes away. Miles of Montana’s quiet and serene back roads surround the Lazy B for those who love the quiet pleasure of sightseeing. In addition, see many of Lewis & Clark’s famous sights nearby.